IBC Bank rallies community support for upcoming tournament. (AUG. 10, 2017) EAGLE PASS, TEXAS - IBC Bank-Eagle Pass brought together the community today in support of the Southwest Baseball Regional Champions, the Eagle Pass 13U All-Stars. The players along with their coaches, family, friends and supporters gathered at the bank for a celebratory send off as the team prepares to travel to Mountain Home, Ark., for the Babe Ruth League World Series, Aug. 8-17. Festivities included a check presentation from IBC Bank President and CEO Hector J. Cerna and donations were made from the community in attendance to offset the team's World Series travel expenses. In addition, the team greeted their fans and autographed collectable baseballs. 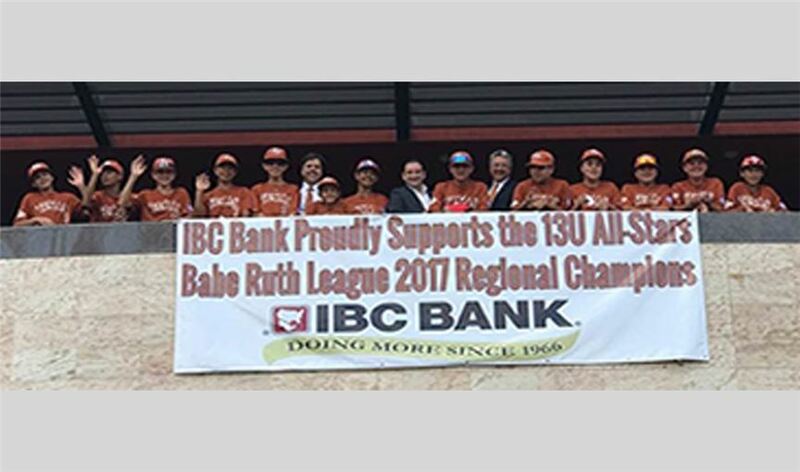 The team banner supporting the World Series team will be displayed during the World Series tournament on the balcony of the Main Street IBC Bank in Eagle Pass. "We are incredibly proud of these kids, this is an example that hard work and dedication pays off," Cerna said. "We all know sports teaches us so much more than how to play a game; it prepares our young people to be great leaders. I not only look forward to following these young men through the tournament, but also as they become more involved in our community." Thirteen young men make up the World Series-bound Eagle Pass 13U All-Stars team. Their first game is Aug. 10 at 12 noon against the Pacific Southwest Regional Champions. In 1951, a group of men dedicated to the youth of America formed what became the very first ten-team Babe Ruth League. Babe Ruth Baseball caught on nationally, then internationally. The program now ranks as one of the premier amateur baseball and softball programs in the world. The program has grown to seven baseball and five softball World Series offered on an annual basis. Each chartered league is eligible to enter a team in tournament competition. District winners go into statewide competition with that successful club qualifying for the regional tournament. The regional champions from across the United States and Canada compete in each World Series. IBC Bank-Eagle Pass is a member of International Bancshares Corporation (NASDAQ: IBOC), an $12 billion multi-bank financial holding company headquartered in Laredo, Texas, with 192 facilities and more than 297 ATMs serving 87 communities in Texas and Oklahoma. In 2016, IBC celebrated its 50th anniversary since opening its doors for business in 1966. IBC Bank's slogan "We Do More" reflects the bank's dedication to the growth and success of both the customers and the communities it serves. International Bancshares was ranked 46th on Forbes' prestigious list of 100 Best Banks in America in 2017. IBC Bank-Eagle Pass has been serving the area since 2002 and has a retail branch network of 11 locations. MEMBER FDIC / INTERNATIONAL BANCSHARES CORPORATION. Visit us on our YouTube channel, IBCBankWeDoMore. More information is available at ibc.com.